Kitchen Tour: Making The Most Of A Small Kitchen! 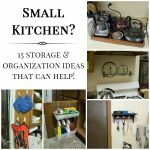 Home > Projects > Home Decor > Kitchen Tour: Making The Most Of A Small Kitchen! I had so much fun sharing our small apartment home tour with you, and I hope you enjoyed it too! So today I’m going to share another little home tour with you, but this one is all about our kitchen! We live in a small apartment, but I absolutely LOVE our kitchen. It’s small, but we make it work, and today I’m going to show you some of the tips and tricks we use to make the most of the limited space! And, at the bottom of this post is an awesome giveaway! Enter for your chance to win a Pfister faucet or a $250 Visa gift card! And there are 23 other bloggers who are going to share a detailed look at their kitchens too, so if you’ve been looking for some kitchen inspiration, you’ve come to the right place! This kitchen is what made me fall in love with this apartment when we were looking a few years ago. It’s a galley kitchen with counters on both sides, so it’s nice and big with lots of counter space! The last apartment we were in had 2 feet of counter space (no joke! ), so cooking in this kitchen is a huge improvement! Yes, that is a pallet down there at the end near the back door. I’m using it as a “lumber rack” right now to store odd bits of wood I have leftover from my projects, because we don’t have a basement or a garage. If you find a whole pallet, you can use it for storing extra lumber, gift wrap, umbrellas, or anything else long and skinny! Because we use the back door most of the time, I figured it would be useful to have a place for all our stuff. JM found this awesome little shelf out in our alley and I knew it would be just perfect for keys etc. 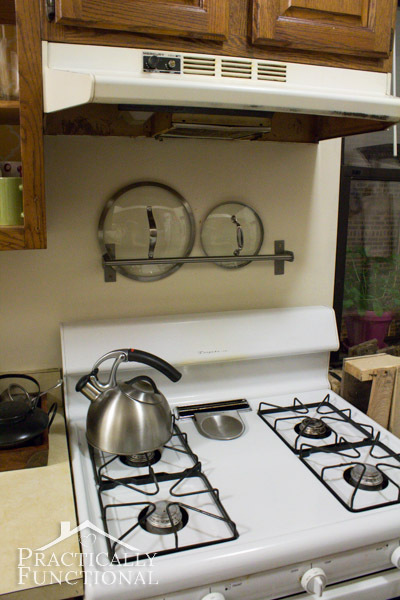 One of the most useful things I did in our kitchen was install a towel bar above our stove to store pot lids as we uncover things that are cooking. I can’t tell you how many times I take the lid off of a pot on the stove and realize that there is nowhere to set the lid down. 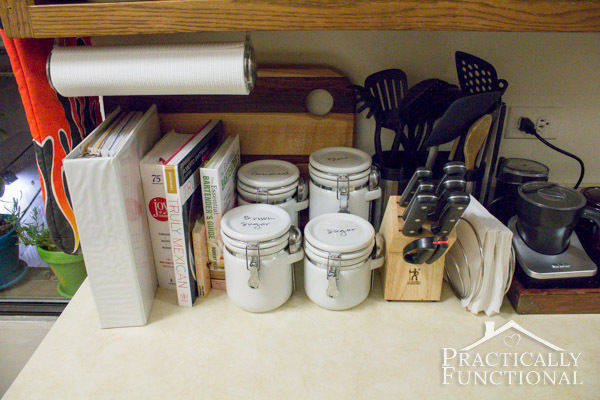 This is the perfect place to store those lids temporarily so I don’t take up counter space! I just finished wallpapering the cabinets and I think it makes a huge difference in the kitchen. The whole room feels a lot brighter and cheerier now! And the wallpaper is 100% removable, which is perfect because we are renting! One problem with the lack of counter space in our old apartment was that we didn’t have very much room for preparing food, and we definitely didn’t have enough room to store anything on our counters. But we don’t have that problem anymore! Now we have enough counter space that we can use the back half of the counter to store things for easy access and still have enough room on the front half to prepare food. 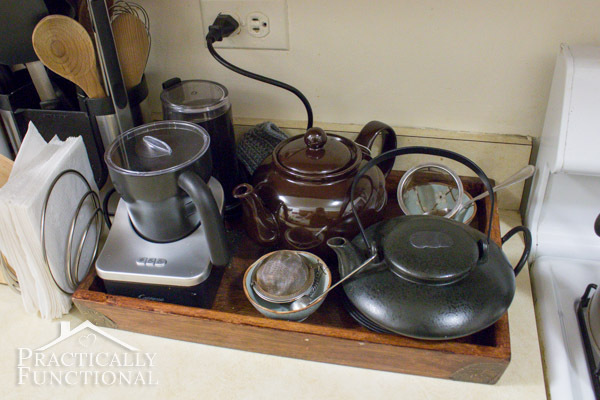 I make tea most days, so I keep all of my tea and beverage making things on a tray right next to the stove. The tray helps keep everything organized and all in one place so it’s easy to find whenever I need it. If you use your counters for storage, make sure to keep it all organized so it’s easy to access what you need when you need it. Storage should be purposeful; don’t just pile stuff on the counters because there’s no better place for it! The large binder on the left is our recipe binder. When I was growing up in California, my mom and I created a recipe binder for all of her favorite recipes. If she ever made anything we liked, I typed up the recipe, printed it out, and stuck it in a page protector in the binder. The binder is organized with tab dividers for Appetizers, Soups, Veggies, etc. and it works great! Mom can take out one page from the binder and leave it on the counter for reference, and if anything spills she just wipes it up with a sponge. So when I moved out I made copies of all of her recipes and made my own recipe binder! 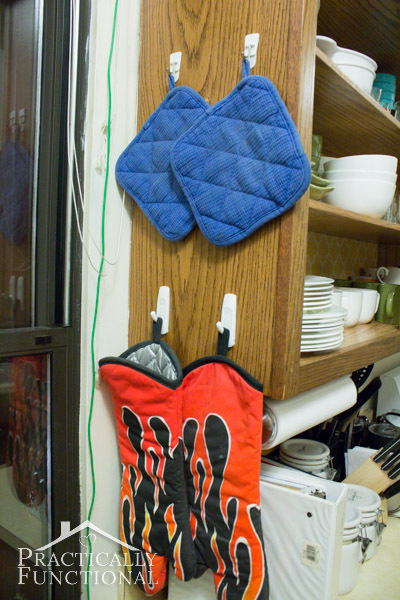 We hang our hot pads on the outside of our upper cabinets. This way we can get at them easily and they aren’t taking up space in our kitchen drawers. Plus the 3M hooks are removable, so again, no permanent changes or damage to the cabinets when we move out! We also put a paper towel holder under one of the upper cabinets so that we could keep them in easy reach, but they wouldn’t have to take up any counter space. 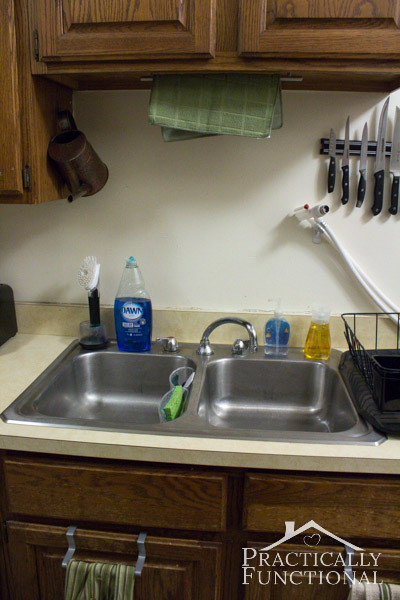 The sink is on the other side of the kitchen, and it’s basically the “command center” of the kitchen. 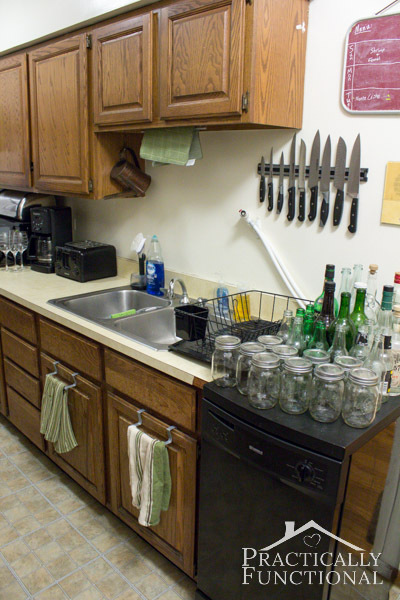 We hung a magnetic knife rack just to the side of our sink, and it’s super useful! 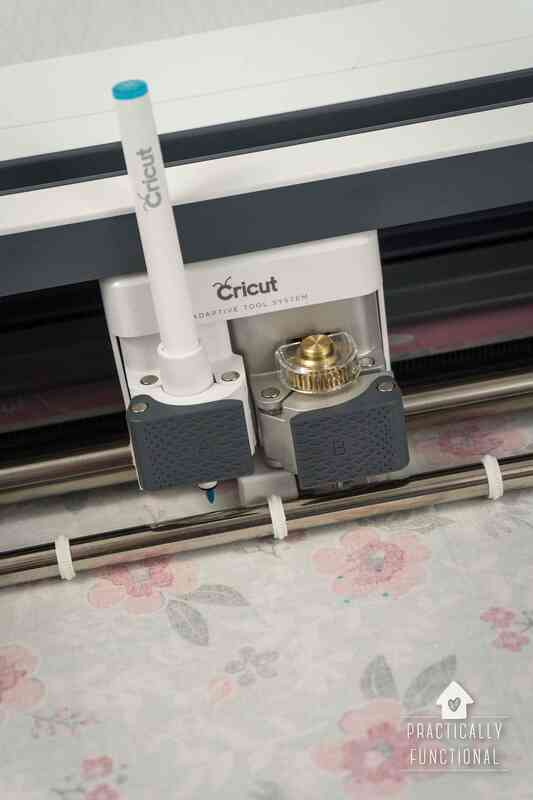 We don’t need to open a drawer and search around for a knife; they’re always in easy reach! I used another 3M hook to hold up the connector end of the portable dishwasher. It’s not the prettiest, but it’s really useful to have the hookup so close to the faucet so we can easily run the dishwasher when we need to. We keep our dish cleaning stuff out on the sink so it’s easy to get to whenever we do dishes. There’s a soap-filled dish brush in a stand at the back of the sink and a few small baskets suction-cupped to the inside of our sink to store sponges and scrubbers. 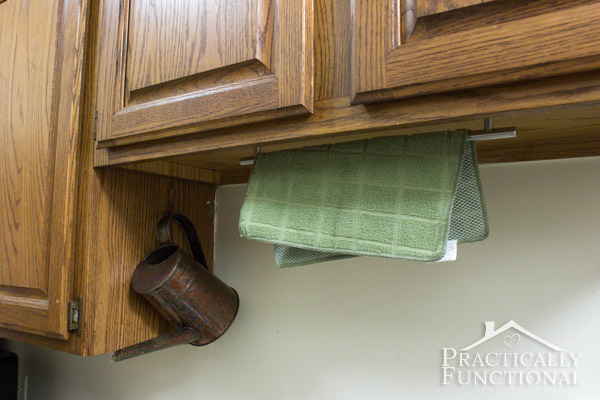 We also hung a door pull under the cabinets above our sink so that we had a place to put the dishcloth to let it dry. We used to hang the cloth over the faucet, but it didn’t get dry enough and then it was always in the way whenever we needed to turn the faucet on, so this is a MUCH better solution! The watering can is hung with a small picture hanger, and it’s perfect because it’s always in easy reach whenever I need to water the plants. We found these great organizers at Bed Bath & Beyond and I knew they would be perfect for our kitchen! They hang over the cabinet doors and have baskets on the inside to store cleaning supplies etc. and a rod on the outside that is perfect for hanging dish towels! 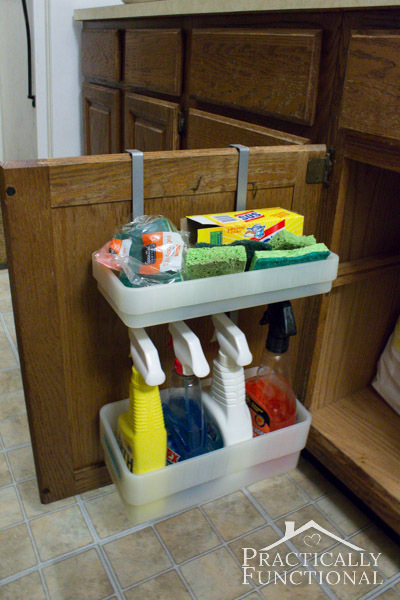 The inside of cabinet doors is a really underutilized storage space, and these organizers give us a lot more room for storage and make it easy to access our cleaning supplies! 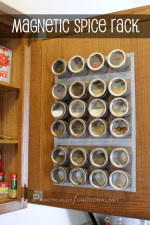 I used the inside of another cabinet door to make a magnetic spice rack, and it has made such a difference in our pantry organization! The spices are easy to find, they don’t take up any room on the pantry shelves, and you can see exactly how much of a spice you have left! At the end of the counter, we hung a produce basket from the ceiling to keep our produce organized and up off the counter. And you can see my little indoor herb garden in the windows! We leave the cat food and water at the end of the counters, and all of the cat toys and supplies are in the little drawers under the windows. JM found an old wine crate out in the alley, and knowing how much our cats love boxes, we stuck a soft little cat bed in it and left it just under the window for them to sleep in. They love it! Also at this end of the kitchen is the dine-in area. When we first moved in we put a small dining table in the space, but we still eat like college students either at our desks or on the couch in front of the TV, so the table wasn’t being used much for eating. I used it a lot for crafting, but the round shape wasn’t really efficient, so we recently got rid of the table and I built in a craft desk! The desk is super useful for crafting, and the storage cubbies underneath really help us make use of the limited space in this apartment! Above the kitchen door hangs one of my very favorite projects: my rustic pallet shelf! We don’t have a liquor cabinet, so I turned part of a pallet into a shelf to hold a few bottles, and it has proven to be incredibly useful! It allows us to create some extra storage space in the kitchen, and it’s up out of the way because it’s above the doorway! So that’s the entire kitchen; it’s small, but it works for us! 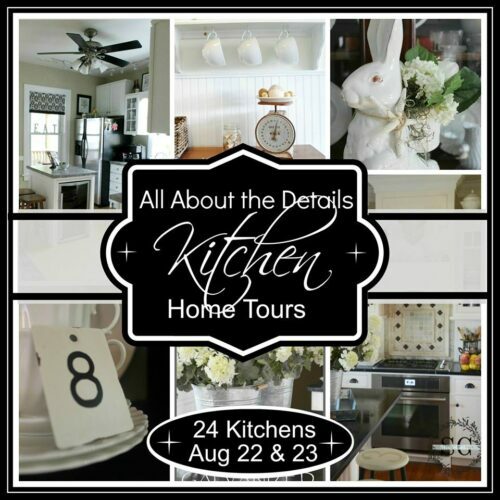 I hope you enjoyed getting a little peek into how we organize our kitchen, and if you’re looking for more, don’t miss the rest of the kitchen tours this week! 18 Ways To Decorate And Organize Inside Cabinets & Drawers! Love all your neat little tricks for making your kitchen more functional! A lot of these ideas are great ones whether you’re renting or not! Love the pot lid holder! I like that you found the inside of the cabinet door useful, great tip! You’ve got that kitchen together, girlie! I love the pot lid holder idea. I’m always frustrated with pot lids! Jessi, You have made the best use of all of your space, I love your spices inside the door. Great idea to add the bright pop of yellow paper on the back of the cupboard. Wow. You came up with some really great and creative ways to maximize your space. I love the towel bars you installed! You certainly have made the most of every inch of space you have. You are so creative with such a small space, love it! You have no idea how much I wish that pot lid bar idea would work in our kitchen! I am always running out of places to put the pot lids, and then they drip condensation all over everything. Sigh. You do such a good idea organizing your small space. And I think you actually have more counter space than my house’s kitchen has, isn’t that sad? 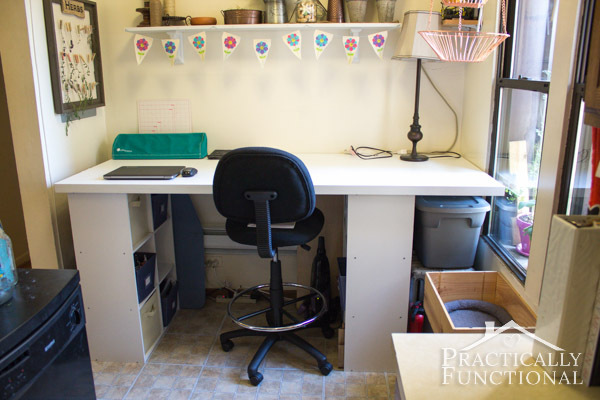 You shared some great ways to use a small space!! I think you did a wonderful job with the kitchen. Very creative ideas. Looking forward to seeing more ideas. You seem to be a queen of making fabulous use out of every single inch of your space, and I love it! The spices mounted on the inside of the door is awesome … and, I love how you added wallpaper to the back of your cabinets for a pop of color! 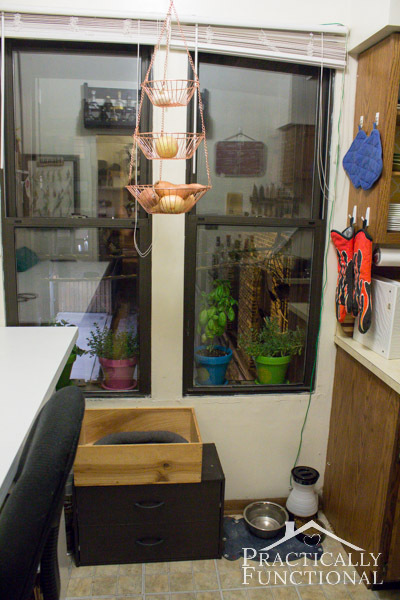 You really know how to utilize small space – it’s neat to see how you have managed. I love all your tea things all together, baskets are so awesome for that. I think my fav is the hanging spice rack – I have often wanted to do just that. Maybe soon, see? You are so inspirational! In fact I have been so inspired that I actually posted my first-ever kitchen tour today in celebration! Thanks for sharing, Jessi! Lots of great tips here. 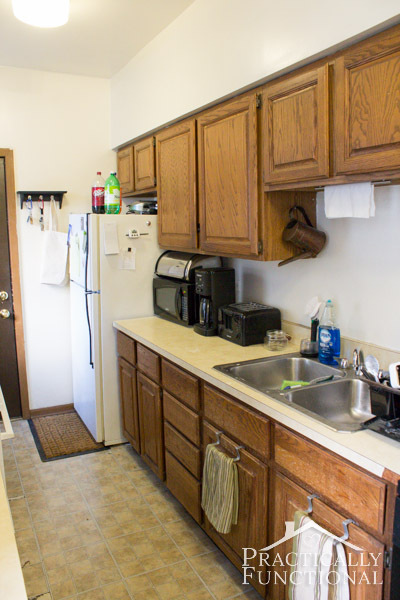 Jessi – You’ve done a wonderful job of making the most of your small kitchen! I don’t think I’ve ever seen so much functionality and organization in such a small space. Really enjoyed your tour and the great tips that you shared. You really have found some great space saving places! 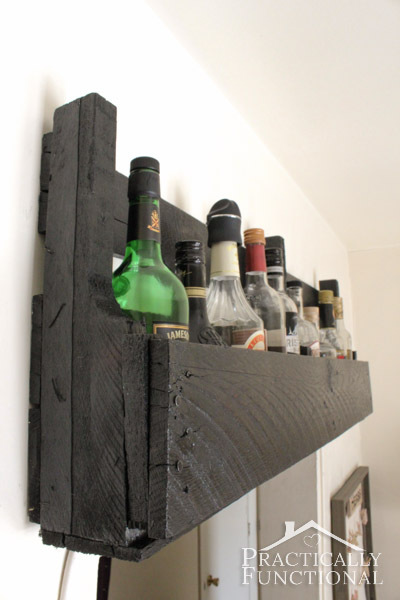 I love your liquor shelf you made that is fantastic! 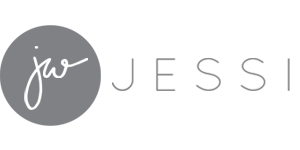 Jessi, I’ve been meaning to stop by and tell you how AWESOME your site looks! Are you loving WP or what?! I think it looks fab! Thanks Carrie, I’m super thrilled with my new design! I just filled out my entry to win in your giveaway and I could not see or am unable to Submit my entry? Hi Anita, I’m sorry but I don’t have any way of submitting the entry for you. 🙁 If the Rafflecopter entry widget doesn’t load for you on the kitchen tour post, you can always click the link just below the text that says “Step 2: Enter the giveaway using the Rafflecopter widget below!” That link will take you to the entry form and you should be able to fill out and submit each entry from there. Good luck! 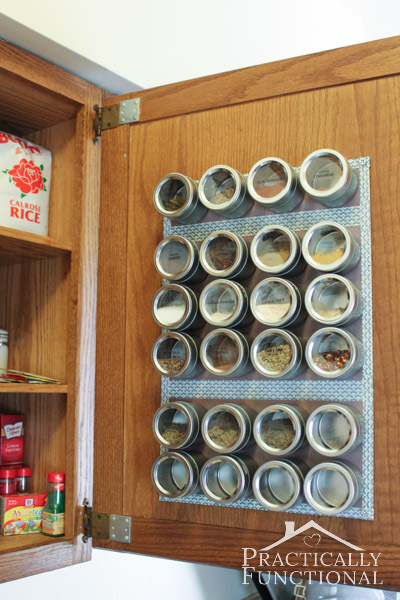 Love that magnetic spice rack. Great use of space throughout your kitchen! Very clever use of space. I can relate to when I had a tiny apartment in NY! Pinned from Blitzen party! Your kitchen is very charming and functional! Loved the tour. Wow..you have made good use of your space..great tips on storage . Great job of making the most with your space Jessi! 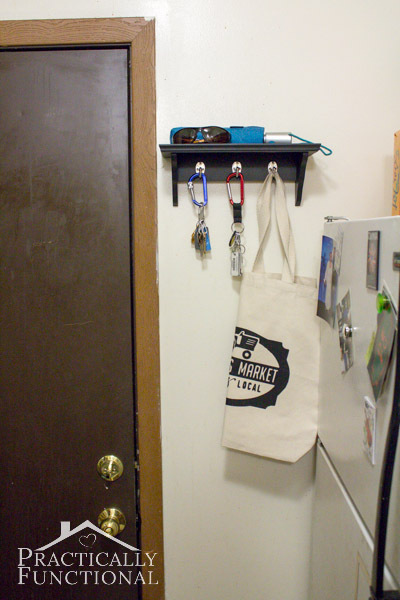 You pallet shelf is so cute and the towel bar’s such a smart idea to keep those lids out of the way. I just saw your linky at Traci’s and wanted to visit. I’m so glad I did. Hi Jessi, This is my first time here. I really love the style and layout of your blog! 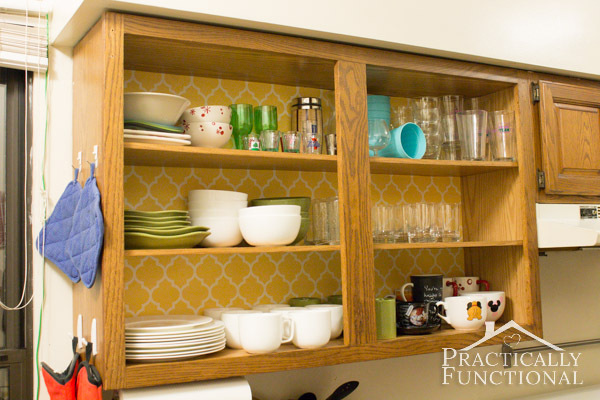 You’ve made creative use of organizing the space in your galley kitchen. I like the pot lid idea and the magnetic spices are great! I have a galley kitchen too and love it! I’ve often dreamed of bigger but I believe in embracing what we have and making the most of it! Aww thanks Sandy, and thanks so much for stopping by! Great organization! Thanks for linking up at Take it on Tuesday!